Marsha and I had a wonderful time on our tour. I must compliment the local guides because they were so kind to us and helpful. I dont remember the name of the young woman who picked us up in Chongqing, but she was very helpful when we had to wait for an extra suitcase that the airline had accidentally left behind in Beijing, and she was able to tell us so much about the city of Chongqing. Charlie in Wuhan was very helpful also. Our boat was late getting in to Wuhan, but he was there to meet us and gave a great tour of a temple and the bonsai rock garden.He also told us so much about Wuhan that Id like to return there in the future to see more of the city. The boat tour was wonderful. We were treated very well and loved the shore excursions. Thank you so much for all your help. I will definitely use your services again the next time I go to China. "Marsha and I had a wonderful time on our visit. I must compliment the local guides because they were so kind to us and helpful. I dont remember the name of the young woman who picked us up in Chongqing, but she was very helpful when we had to wait for an extra suitcase that the airline had accidentally left behind in Beijing, and she was able to tell us so much about the city of Chongqing. Charlie in Wuhan was very helpful also. Our boat was late getting in to Wuhan, but he was there to meet us and gave a great tour of a temple and the bonsai rock garden.He also told us so much about Wuhan that Id like to return there in the future to see more of the city. The boat tour was wonderful. We were treated very well and loved the shore excursions. Thank you so much for all your help. I will definitely use your services again the next time I go to China." "My Son and I had a very nice tour of Beijing and the Great Wall! Your tour guide, Vivian, was very efficient and made our visit very enjoyable." My wife Marcia and I just want to thank you for a wonderful experience in China. We could not have asked for better guides or travel arrangements. Your employees, Shu in Beijing, and Dorothy, in Xian, were just great! We were so fortunate to have found you. Our friends on board the ship who made arrangements via the ship line and other agencies had a very difficult time arriving in Beijing, but because of your employees and their helpfulness we were able to arrive in Beijing early. Our shipmates unfortunately did not arrive until four hours later! We appreciated so much all the help and information that was given to us by your people. We have and will continue to highly recommend your company to our friends who frequently travel to China. Thank you again for making this a life long memorable experience. We wish you well in the future and perhaps will be using your company again in future travels. 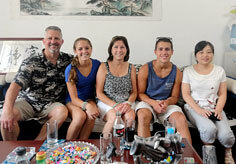 "My wife Marcia and I just want to thank you for a wonderful experience in China. We could not have asked for better guides or travel arrangements. 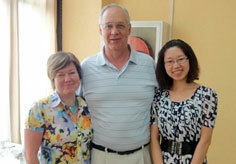 Your employees, Shu in Beijing, and Dorothy, in Xian, were just great! We were so fortunate to have found you. Our friends on board the ship who made arrangements via the ship line and other agencies had a very difficult time arriving in Beijing, but because of your employees and their helpfulness we were able to arrive in Beijing early. Our shipmates unfortunately did not arrive until four hours later! We appreciated so much all the help and information that was given to us by your people. We have and will continue to highly recommend your company to our friends who frequently travel to China. Thank you again for making this a life long memorable experience. We wish you well in the future and perhaps will be using Travel China Guide again in future travels."